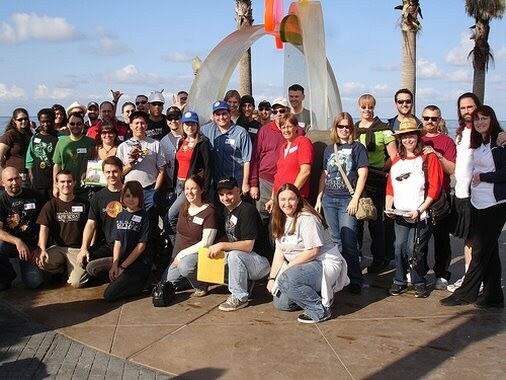 The 2007 San Diego Rocket Race was held on Saturday, November 10th, 2007. "TIME WARP!" was the race theme for 2007. Ten crews of racers got out their time machines to see who could get to the finish line first*. All ten teams found the finish line outside the San Diego Museum of Natural History in Balboa Park, home of the Dead Sea Scrolls exhibition. Times include the mandatory one hour lunch break. The Green Flash - sculpture at the west end of Ventura Place (at the westernmost end of West Mission Bay Drive, next to Belmont Park and the Giant Dipper Roller Coaster). If you need a map, go here. It turned out that our starting place and time was some sort of temporal nexus - not only was the Time Warp starting here, but also we got flashmobbed by a group of geocachers, and were on the walking route for the San Diego Breast Cancer 3 Day. The Green Flash is a popular spot! Clue 1 (pdf) came in a packet with three future clues with instructions not to open them until told to do so: one from Future Hiro Nakamura (pdf), one from Alternate Jack O'Neill (pdf) and one from the Once and Future King (pdf). Team Totally Rad Show features their Rocket Race experience in episode 37: Deadly Discs (Part I at 16:36-21:30 and Part II at 40:29-46:53). Debby's flickr album of the starting line, the checkpoint outside the County Building, and the finish line. James (The Redcoats) has his flickr album of the race. Chip (checkpoint volunteer) has photos from his checkpoint and from the finish line. Got photos or blog articles about the race and want to share? Send us your links at sdrocketrace@gmail.com. Check out results and clues from the 2006 Rocket Race. *All racers were required to race at normal time (traveling through time no faster than 1 second per second).